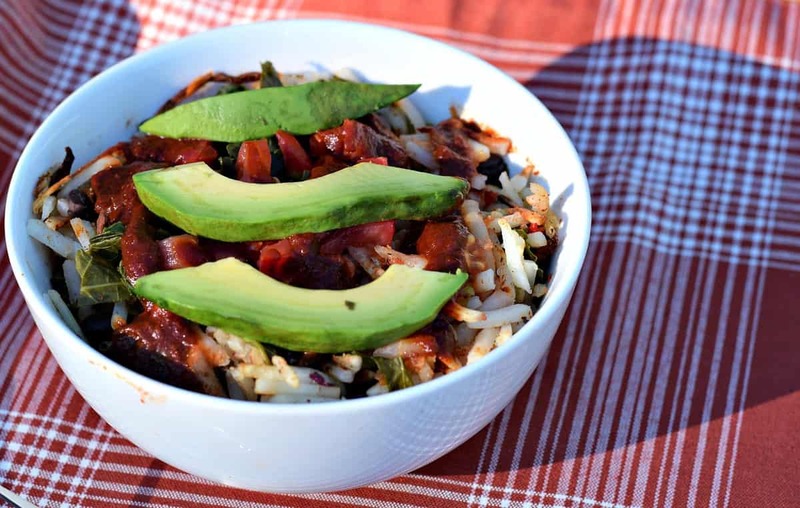 This Mexican Hash Brown Bowl was inspired by Rip Esselstyn and his Engine 2 Diet site and is SOOO good, especially with a drizzle of my New Mexican Red Chile Sauce. 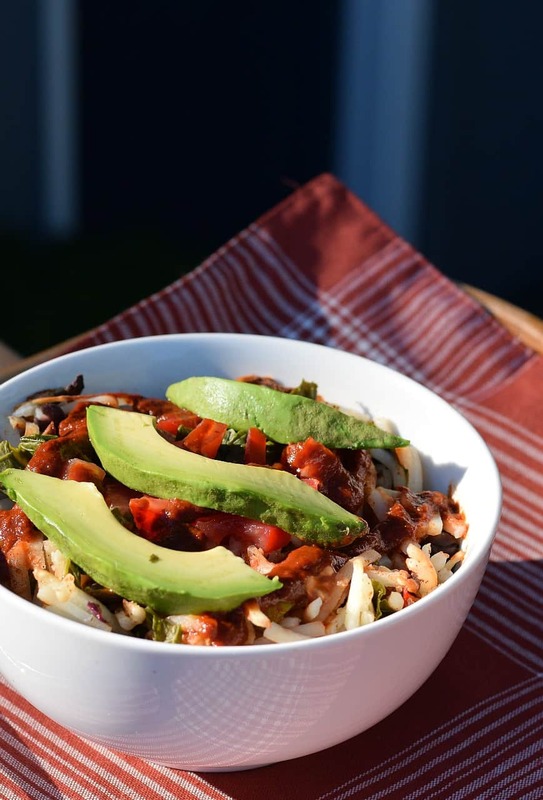 Baked hash browns, roasted bell peppers, sweet onion, black beans, and steamed kale come together to make this not only a nutritious dinner, but also a doggone tasty one at that. And with a giant spoonful of my Red Chile Sauce drizzled on top? OMG! SOOOOO so so so good! Red Chile and Potatoes were just made to go together, kind of like Tom and Jerry, Peanut Butter and Jelly, Shaggy and Scoob…….well ….you get the idea. For all you potato lovers out there, you’re going to want to try this one for sure! In a small pot, simmer a can of Black Beans until heated through. Drain and set aside. Chop about 3 cups (6oz container) of Baby Kale (or Spinach if you’d rather), removing all the stems, and steam until wilted. I used my rice cooker with a steam basket. Finally, line a cookie sheet with Parchment Paper and spread about 6-7 cups of frozen Hash Browns to cover evenly. I used a little over half of a 30oz bag of Mrs Dells which you can buy at Walmart. I like Mrs Dells Hash Browns because they contain NO OIL and are 100% fat-free. 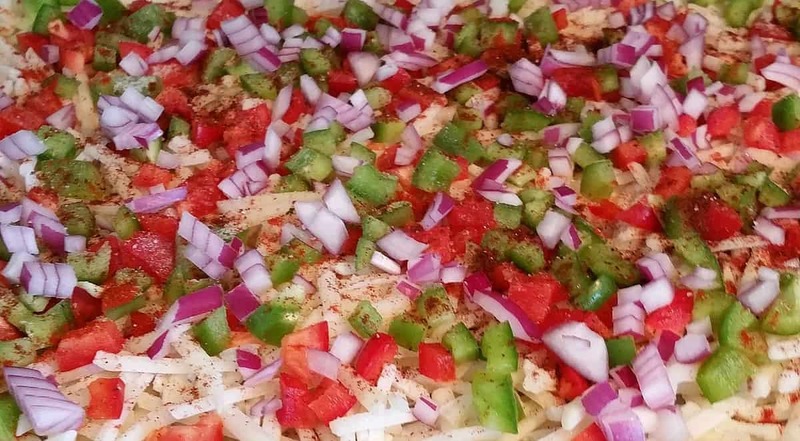 On top of your hash browns, sprinkle about ½ of a chopped Red Bell Pepper, ½ of a chopped Green Bell Pepper, and ½ of a chopped Red Onion. Season with ½ tsp each of Garlic Powder, Onion Powder, Smoked Paprika, and 1 tsp of Chili Powder. Bake in a 450° F oven for 30 minutes. To assemble, take your favorite bowl and layer in a few scoops of Hash Browns, a spoonful or two of beans, and another spoonful or two of steamed Kale, and mix well. Top with Salsa, Sriracha, or my favorite…. NM Red Chile Sauce. Dig in! See? Told you this was going to be easy! Love the comments – be sure and leave a few! 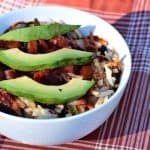 This tasty Mexican Hash Brown Bowl is super easy to make and full of southwestern flavor. Top with your favorite salsa, hot sauce, ketchup, or my favorite - my NM Red Chile Sauce. Top with Salsa, Hot Sauce, Sriracha, or my personal favorite - my NM Red Chile Sauce. Thanks for the tip on Mrs Dells – I’ll have to go to my local WalMart to check for this produt.